As writers we are exposed to different types of writing. Play writing, fiction, poetry, nonfiction, creative nonfiction- the list goes on and on. From day one I have considered myself a fiction writer, and that was that. Set in stone, forever known. But, that has changed over the course of these last two weeks. My friends told me to be prepared for what they called “Poetry Boot Camp,” but the group of desks and a stool in the front of the room aren’t as intimidating as they make it out to be. I don’t particularly like change. 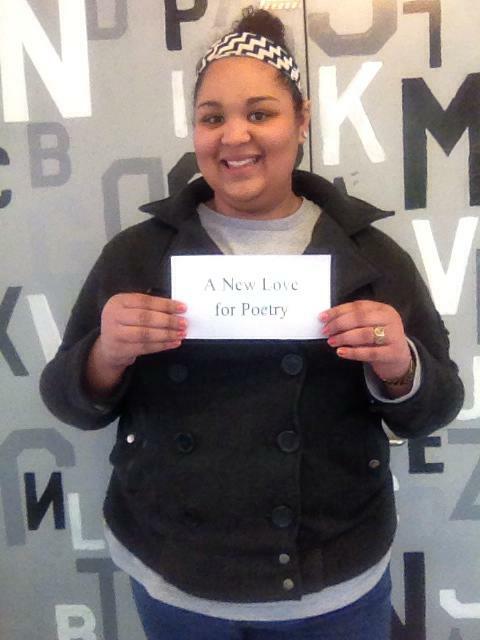 I never thought I’d be saying this but I have developed a true love for poetry and the feeling that it brings people. It sounds cliché but, I have never in my life experienced something quite like it. I remember sitting in class and reading “A Blessing” by James Wright. I was sitting in my desk thinking about how the poem was saying so much to me as a reader in just a few lines. Before my recent poetry class I never understood how a poem could move you in a way that is difficult to put into words simply because the words were chosen carefully and placed in a specific order. I am still very passionate about fiction as a writer but, I think merging my love for both poetry and fiction gives me great advantages as a writer. I’ve found myself going back to my short stories for poem ideas. It’s a great place to start if I’m stuck. Samuel Taylor Coleridge once said, “Poetry: the best words in the best order.” And as a writer I am forever searching for those words to put them in my own “best” order.